Do you want to learn how to save your family money on groceries each week? If so, you are in luck because I am sharing my couponing methods to you, for free, in the 5 simple lessons below. So, grab a nice warm cup of coffee, get comfortable, and read your way to savings! Say goodbye to the days of running to the store when you are out of an item or need to figure out something to throw together for dinner. Instead, you will be planning out your shopping trips in advance, stocking up items when they are at their lowest prices, and keeping the items you use the most on hand to grab when they are needed. Not only is this way of shopping going to save you tons of cash, but it will also give you the peace of mind of knowing that when your toilet paper roll, bottle of laundry detergent, shampoo, or your box of cereal run out you do not have to rush to the store because you have plenty more available right in your own home! Trust me, this peace of mind is priceless! You will find coupon inserts in most Sunday papers. The number of inserts varies from week to week. It is important to note that inserts and coupons often vary from newspaper to newspaper. As a new couponer I recommend getting your hands on no more than 2-4 copies of each insert per week. This means either subscribing to multiple copies of the paper, picking up multiple copies at the store, or asking friends/family/co-workers to hook you up with their inserts. If you are going to subscribe you should check with your local paper that they carry all 3 of the major inserts – Smart Source, Red Plum, and Procter & Gamble. If you pick them up in a store, be sure to flip through each paper to be sure it includes all the weeks inserts — it is a total bummer to bring home a paper only to find it's missing inserts! Every now and then I find a coupon or two or even mini inserts in my magazine subscriptions. By far the best magazine to find coupons in is All You Magazine – This magazine is chock full of coupons – sometimes over $100 in coupons per month. All You issues are sold at Wal-Mart or you can subscribe for only $1.66 an issue! Online coupons fall into two major categories: printable coupons and electronic coupons (eCoupons). Printable Coupons – There are literally thousands of coupons out there right now, just waiting for you to print them! eCoupons – after linking your store rewards cards with these sites/stores you can “clip” coupons electronically and have them automatically applied to your order at checkout. Although not actually coupons, there are a few awesome apps out there that you can use to save even more money at the grocery store. Check out this post for more info and to download these apps: Top 6 Money Saving Apps – Save on Groceries WITHOUT coupons! My #1 tip to saving the most money on products is to match up store sales with coupons. Most stores have a weekly ad with sale prices and promotions. If you buy an item when it is on sale or part of an awesome promotion and use a coupon you will be able to maximize your savings! example: Your store has Colgate Mouthwash for $4.99 at regular price. You have a $2 coupon but using it now will still leave you paying $2.99 for the product. Instead, you save the coupon until the product goes on sale for $2.49. Now you can snag the product for only $0.49! My #2 tip to saving the max on products is to pair a manufactures coupon with a store coupon for a product. Many stores like Shop Rite, Rite Aid, Walgreens, Target and CVS offer store coupons which you can “stack” with manufactures coupons to further maximize your savings! example: Your store has Pop Tarts for $2.99 at regular price. You have a $1.50 manufacturer coupon and a $.75 store coupon. Stacking both the manufacturer coupon with the store coupon will allow you to pay only $0.74 for the product! example: My favorite grocery store to coupon at is Shop Rite — my store doubles coupons up to $0.99 – meaning a $0.25 coupon will double to $0.50 and a $0.75 coupon will double to $1.50! When it comes to couponing jargon, the number of abbreviations alone can scare a new couponer away! But have no fear, I have compiled a list of the meanings of couponing's common jargon and abbreviations. There are 2 common methods of organizing coupons: the binder method and the folder method. Use: When inserts arrive cut out all the coupons and tuck them into slots in their corresponding category. Benefits: less time spent planning for a shopping trip since you can grab your coupons and go, rather than having to cut them out. Can easily bring binder to store and grab coupons as needed in case you see any unadvertised deals. Drawbacks: Takes a lot of time up front to cut and organize. Set up: Place folders in file drawer / box / crate. Use: When inserts arrive stick each in a folder and write type and date on tab (e.g., SS 3/21). It may be helpful to use folders to color code insert types (e.g., red for RP inserts, blue for P&G, and green for SS). Benefits: Takes less time up front, just pull inserts from papers and file in folders. Drawbacks: Takes more time when planning a shopping trip since you will need to pull inserts from folders, find the coupons, and clip the coupons you will need. Each method has its benefits and its drawbacks. It really comes down to matter of personal preference — it may be beneficial to try each method to determine which works best for you. Dun, dun, DUN! 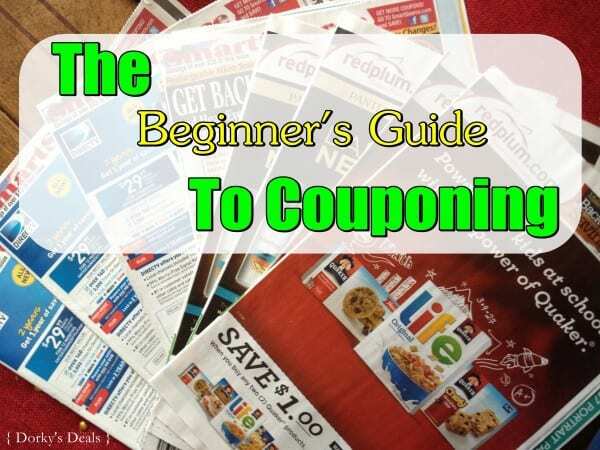 You have made it to the end of the How to Coupon Guide – Congratulations! Now, go show the grocery store who's boss! Thanks for all this info Jaclyn Anne are there ever coupons for virtual products or tech goods? You are very welcome Michael. I am sure that there are coupon codes out there for things like subscription fees… To be honest, virtual products and tech goods are far from my relm of couponing knowledge which focuses on physical items – mainly groceries / household items that you would buy in a food store or drug store. Sorry that I couldn’t be of more help! I am going to be getting my coffee and going through these, thanks very much. great info! Thank you for sharing with us! This is awesome. Thanks for sharing this! Thanks for all the couponing tips. This is such a great resource! Thanks for putting it all together. Having it in one place will be awesome for me! Bookmarked!